Consider your audience and purpose. All of these are important aspects of giving a good class presentation, but before you can begin research or even begin to think about your audience, you need to know what the presentation requirements are. How long is the presentation supposed to be? Do you need to provide a hand-out or create a PowerPoint? Is the topic given to you, or do you need to come up with your own? If you are getting marked on your presentation it is especially important to know exactly what you need to include and plan accordingly. If you are unclear about what is required, talk to your prof early. Once you are clear on the assignment details, you can start the research process and tailor your presentation to suite the specific audience you are speaking to. Depending on who they are, you can ensure that the background information and examples relate to their interests and build on their pre-existing knowledge. For more ideas on how to create an effective class presentation visit here. trying to fit everything in. Many people have a fear of public speaking, but unfortunately, that doesn’t stop professor’s from assigning oral projects. The best way to calm your nerves is to make sure that you are well prepared and have practiced your presentation many times beforehand. Winging it is definitely not going to help! If practicing isn’t enough, try standing behind a podium, or holding a pen in your hands to limit your fidgeting. For some more tips on minimizing public speaking anxiety, go here. An important part of giving a presentation is that you need to be concise, or your audience will get bored. Remember, the human brain can only process so much information at once. If you try to communicate everything, your audience will remember less. If your audience only remembers one thing, what would it be? That's what you need to be focusing on. After ten minutes of the same thing your brain starts to lose focus. To retain the attention of your audience, break up the pattern of your presentation. Ask questions that get them thinking and keep things short and sweet. It’s also important that your presentation is relatable so ground it in what your audience already knows and use simple language. If you're introducing new concepts or complex ideas, try to use metaphors that your audience is familiar with. 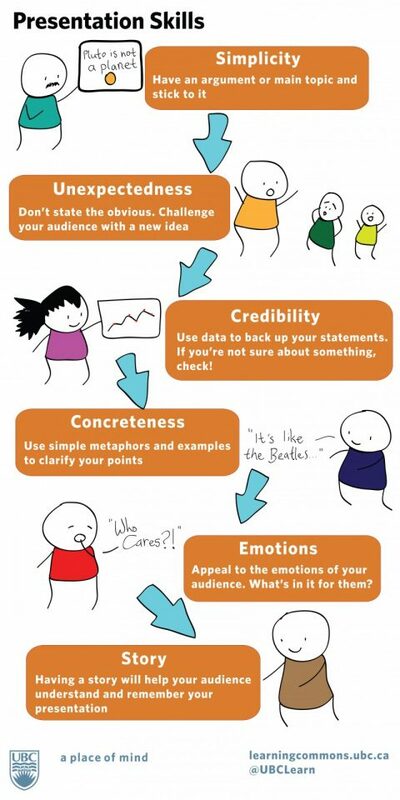 For more ideas on giving a good presentation check out this PowerPoint from Princeton University. The key to making sure your presentation is engaging is to look like you are enjoying it. If you aren’t excited about your topic, why will your audience be? It’s also important to make sure that you don’t read your notes or your slides word for word and that you use hand gestures and eye contact. Using emotional hooks can also help your audience remember your ideas. Make it personal. Make it specific and real. Emphasize human experience wherever possible rather than simply stating facts. 3. Including media and visuals is an important part of giving a presentation. Supplementing your presentation with visuals, video and/or audio will help to make it more engaging. However, it is important that you don’t overwhelm your audience with too much information in visual form. If you are making a PowerPoint or Prezi, keep each slide simple and focus more on the material than on the visuals. Charts and graphs and pictures are there to accentuate what you are saying, not to take away from it. It is also important to remember that any text must be large enough for the person at the back of the room to read it, and only your main points should be included on slides or handouts. Some tips for making better PowerPoint presentations can be found here. Though it is generally not mandatory, supplementing your presentation with visuals, video and/or audio will help to make it more engaging. However, it is important to remember not to overwhelm your audience with too much information in visual form. If you are making a PowerPoint or Prezi, keep each slide simple and focus more on the material than on the visuals. Charts and graphs and pictures are there to accentuate what you are saying, not to take away from it. it. Do you allow guest post on your page ? I can write hi quality articles for you. Tell us what you think of the Presentation Skills Toolkit. Please select a response.